10. धाम-परिक्रमा व हरिनाम इत्यादि करते हुए भी मंगल होता दिखाई क्यों नहीं देता ? Traditionally, in the Jhulan-yatra (swinging festival), conditioned souls (ordinary aspirants) are not entitled to enter. Yet, our Guruvarga has introduced this. This is a type of worship of Supreme Lord. Radha Krishna are the object of all love. Now we are actually worshipping Lakshmi Narayana, not Radha Krishna. Where there is wealth, love is restricted. 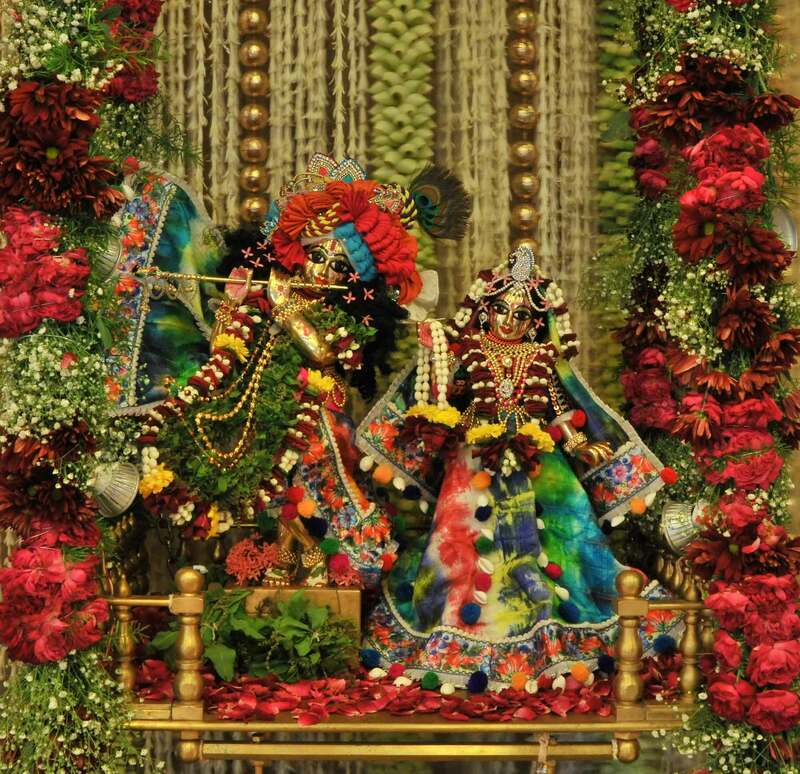 We are not entitled to worship Radha Krishna as we have not reached that stage, which is the completely sweet aspect. In the swinging festival, only gopis are allowed. Gopis’ love is the highest level of love that one cannot imagine. How gopis are completely attached with Krishna is beyond our imagination! In swinging festival, only Radha Krishna and the gopis are there. Even Nanda Maharaj, Yashoda Devi, other friends and servants are not allowed. They say, “Oh, Krishna you are our friend and we are equal to you. But you have got some power, you are very healthy…so you should remain on the ground and we shall climb upon your shoulders and get you the fruit from the tree.” This way they go up, up, up, up (climbing one upon another’s shoulder) and Krishna is standing on the ground. They pluck one fruit for Krishna’s sake. They taste whether it is sweet, bitter, or sour. “Aah, it’s very sweet! Give it to Krishna” and passes on to the next one. Next one also wants to taste whether it is true or false, “Let me taste.” In this way four or five friends taste the fruit and then give it to Krishna, Who will take it with so much satisfaction. How can you understand that (transcendental) world and this sort of prem? Yet, even the sakhas are not allowed there in this swinging ceremony. And Nanda Maharaj’s prem is further more affection for Krishna than friends and they also have no entrance. In Bhakti Ratnakar, a Bengali scripture written by Narahari Chakravarthi, it is written that Jhulan-yatra is performed in Kamyavan, one of the 12 forests in Braj Mandal. One Goswami of South India performed Bhajan in Govardhan. At that time he had shown all the places of pastimes of Radha Krishna to Srinivas Acharya and Narottam Thakur. When he came to Kamyavan he had shown them nice groves of kadamba trees, where Radha Krishna and all the sakhis and confidants get immersed in immensely blissful transcendental pastimes. They performed several pastimes there. One of the pastimes is Swinging festival. It occurs in the month of Shravan. It starts from Ekadashi (11th lunar day) to full moon day for 4 to 5 days. Here they did Jhulan (Swinging) festival in the month of Shravan, but Jhulan in Radhakund is performed daily by the gopis. We remember this swinging festival, daily in Kartik festival during the midday pastime of Radha Krishna. It’s called Dola Khela. We can do this worship for 5 days as per Archan marg. So our guruvarga said you can do it through sankirtan, by praying for grace, for entering into the transcendental realm. But as long as there is material ego there is no possibility. But we should not be disappointed. Chaitanya Mahaprabhu said, “Namasankirtan karo parama upaya. 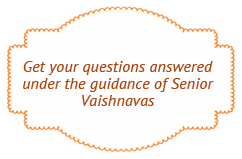 I have given Radha Krishna Sankiratna—Mahamantra. Everything is in the Name. Do it without tenfold offenses.” By doing Radha Krishna mantra gradually one will transcend Vidhi marga and go into Raga marga. Do Harinam and associate with pure devotees and hear from them. It will come gradually. You cannot jump into it. First we have to chant the Name, then when our mind will be clear, Form will be revealed in the heart. In mantra there is Form. This form will manifest. As you continue Harinam, all other subtler attributes will manifest. Finer than this are personal associates in their spiritual eternal bodies, then Krishna’s spiritual eternal body, Radharani’s spiritual eternal body, and the gopis’ eternal spiritual bodies will manifest. In this kaliyuga you have to give primary importance to Harinam. You can do other devotional forms but with simplicity. Without spoiling your time, go on doing Harinam with firm faith and your life will be successful.